The alarm clock becomes a haunting reminder as you calculate just how long it is until the sun rises and it becomes socially acceptable to be as awake as you are. Perhaps you get up and read a book or watch some television in order to, as you tell yourself, “fall back asleep.” But the fact is you never were asleep and you don’t see the sweet embrace of slumber coming anytime soon. So eventually you give up on simply passing the time and try your hand at being productive while the rest of the world is soundly asleep. Maybe you pay your bills, wash some dishes, vacuum the house, wake up the dog and drag him around the block, or think about calling friends and family who live in far-away time zones and currently share your same wide-awake status. Regardless, you are constantly fighting yourself-wrestling to reconcile the difference between how you feel and how, because it is pitch black outside and the clock reads 3:17 a.m., you think you should feel. Eventually dawn breaks and the rest of your life catches up with you and you are able to start your day, albeit minus one key ingredient-a good night’s sleep. Welcome to the world of insomnia. I am sleeping pretty well these days, but it hasn’t always been that way. It started in high school with occasional spurts of one, two, or three sleepless nights in a row. I would bemoan my 6 a.m. wake-up time as I tossed and turned, the red digitized glow of my clock pushing me deeper into angst. The professionals call this Transient Insomnia, and they chalk it up to excitement or stress. My short-lived flings with insomnia continued into college and then my early twenties. I never enjoyed them much but rather sought to conquer them with a variety of techniques, like copious amounts of cheap beer, piping hot cups of herbal tea, the occasional sleeping pill, and stupid amounts of exercise. None of this worked very well, but eventually dream time would return to my nights and I would blissfully carry on as if sleeplessness had never happened. Plus, the fact that during these years I was surrounded by peers who also didn’t sleep much-or at least didn’t sleep much at night-I never really felt alone in my experience. It seemed everyone in college was overtired, puffy eyed, and happily running on empty. I was detached from reality but I didn’t know it, save for rare moments when the true meaning of what I was doing hit me over the head like an anvil. But as the back half of my twenties set in and life took on a decidedly more structured routine, my habits of not sleeping became more obvious to me. 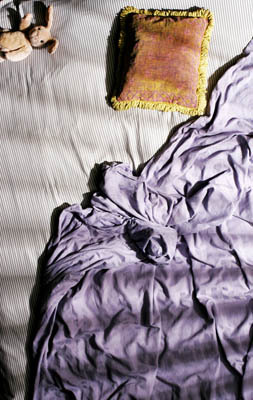 Girlfriends got annoyed and started to take it personally when I seldom remained in bed; friends and coworkers, no doubt noticing the darkly hued half moons under my eyes, would ask repeatedly, “Are you okay?” However, buoyed by some late-night research I had done into the historical sleeping patterns of humans, I began to see my nocturnal habits as an opportunity rather than a hindrance. In fact, I started thinking about it as a sort of super power and began using it to my advantage. I would work as a substitute school teacher during the day and then stay up all night working security on a Gaviota Coast ranch. I wrote stories, read books, dabbled with a guitar, surfed by moonlight, took long walks, and studied the stars when the rest of the world slept. When I allowed myself to think about it, my average two or three hours of sleep a night concerned me-especially when I would go a couple days with nary a wink of shuteye. But mostly, I just enjoyed it and the pleasant narcotic effect it had on my daylight hours-everything wonderfully blurry and dreamlike. I was detached from reality but I didn’t know it, save for rare moments when the true meaning of what I was doing hit me over the head like an anvil. I’ll never forget the morning I wandered into the Daily Grind on Mission Street, the hustle and bustle of people just starting their work day all around me. Working three successive overnight security shifts and four full days of carpentry, I hadn’t slept in 72 hours. Listening to the dialogue of the people waiting in line next to me, I could actually see the remnants of sleep hanging on their every word as the early morning sunlight did a psychedelic dance around the room. Suddenly, I was lost in the world, unsure of the day, time, or even my presence in the moment. Was I alive? Was I a ghost? Could anyone even see me? Why hadn’t I noticed the physical presence of words coming out of people’s mouths before? It wasn’t until the kid behind the counter asked me in an annoyed tone, “Can I get you anything, buddy?” that I snapped back to attention. After ordering a large sleepy-time tea and realizing that the twitch in my left eyelid was actually a heartfelt longing for my bed, I decided I should seek some professional advice. According to my doctor, I was experiencing Chronic Insomnia, something that afflicts 20 million Americans a year and, much like my teenage episodes, was due, most likely, to some sort of stress or psychological situation. With a bit of over-the-counter help and a conscious effort to undue my sleeplessness rather than encourage it, I eventually reclaimed an REM-informed lifestyle, at least for a while. Last year, the boogie man returned in earnest and I spent the better part of my winter and spring rekindling my nocturnal productivity. After two years of overall good sleeping, this development was absolutely maddening and much more damaging than my previous battles. Besides turning my days into Swiss cheese interpretations of the space-time continuum, my nights were a horrific mind-bend as I obsessed about my work schedule for the next day and how a lack of sleep was sure to implode it. This line of thinking of course compounds the whole stress equation, thus furthering the pattern of sleepless nights, and the vicious cycle continues to no end. Luckily, I have pulled out of this sleep-starved tailspin in recent months, thanks mostly to a beautiful and brilliant woman from Montana who seems to ease my inner madness. But on any given night it could return, or at least that is the fear. Such is the life of an insomniac-clocks are instruments of terror, nightfall an entity of irrelevance, and dreams a sweet and all-too-fleeting reprieve from a zombie-like life that threatens to return with no notice at all.